Yep. You see, I live on a farm with 3 goats, 6 cows, 8 alpacas, a llama, 3 cats, a dog, and 49 chickens. Don't tell the other animals, but the chooks are my favourites...they're just SO darned entertaining. 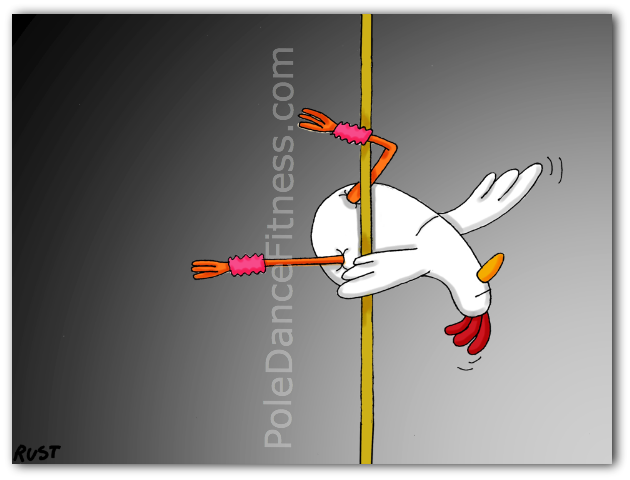 One day, I was thinking about all the funny pictures I've seen of puppies and kittens and other animals "pole dancing" and I thought it would be fun to have a drawing done of one of my chickens doing the same thing. So...I headed on over to Fiverr.com and hired this guy to draw me a pole dancing chicken! Pretty cool, huh? Do you have any cute or funny animal pole dancing pictures of your own to share? Maybe a pole dancing pony, or a llama? If so, I'd love to see it, and I'll share it with my site's visitors right here on this page. It's quick and easy to upload your image, and you can even add a caption and/or description. Please upload only one image and caption at a time, so we can keep them together. Entering your photo information is easy to do. Just type a short description about your photo. Click the button to find your photo on your computer, then select it. Easy!